To Cite: Shokrollahi Barough M, Hasanzadeh H, Barati M, Pak F, Kokhaei P, et al. Apoptosis/Necrosis Induction by Ultraviolet, in ER Positive and ER Negative Breast Cancer Cell Lines, Int J Cancer Manag. 2015 ; 8(6):e4193. doi: 10.17795/ijcp-4193. Background: Ultraviolet (UV) light exposure has been one of the major inducers of apoptosis. UV exposure has caused pyrimidine dimers and DNA fragmentation which might lead to cell cycle arrest and apoptosis signals activation. UV induced apoptosis has investigated in MDA-MB 468 as an ER negative breast adenocarcinoma and MCF-7 as an ER positive breast cancer cell line. Apoptosis induction rate by UV might be different in these two types of cells due to different biological characteristics of the cell. Objectives: In this paper we have evaluated serial dose of UV-B exposure on ER positive and ER negative breast cancer cell lines and its effect on apoptosis or necrosis induction in these cells. Materials and Methods: MDA-MB468 and MCF-7 cell lines have cultured for 24 hours and UV exposure has carried out at 290 nm at dose of 154 J/m2 to 18 KJ/m2 using UV lamp. UV exposed cells have incubated in cell culture condition for 24 or 48 hours following UV exposure and the cells have stained and analyzed by flow cytometry for apoptosis evaluation by Annexin V/PI method. Results: Apoptosis rate (PI and Annexin V double positive cells) after 24 hours incubation was higher in 24 hours in comparison with 48 hours incubation in both cell lines. The frequency of PI positive MDA-MB 468 cells was higher than PI and Annexin V double positive cells after 48 hours. PI positive MDA-MB 468 cells were significantly higher than MCF-7 cells in 24 hours incubation time. Conclusions: The results have shown that MDA-MB 468 cells were more sensitive to UV exposure and DNA fragmentation and necrosis pathway was dominant in these cells. Proliferation and prognosis of human breast cancer has been dependent on several factors such as their hormone or estrogen-responsiveness, expression of estrogen receptor (ER) and other genes. Hormone-independent (ER negative) tumors were more aggressive and development of clinical protocols for treatment of these highly invasive breast tumors has been a major challenge in hormone therapy or chemotherapy protocols (1). Estrogen-responsive and hormone-independent human breast cancer cell lines and in vivo animal models have extensively used for studying the factors responsible for cell growth, differentiation and finally developing new strategies for inducing programmed cell death or studying about breast cancer pathogenesis and treatment (2). Breast cancer cell lines have classified in 5 sub type; Laminal A, Laminal B, Basal, ERB2 positive and normal breast like cells that these were different with each other by estrogen receptor (ER), progesterone receptor (PR) ERBb2, Her2neu expression panel (3). Estrogen independent cell lines such as Hs578T, MDA-MB-231, MDA-MB 435 and MDA-MB468 were aggressive and high metastatic (4) and isolated from high grade tumors (5), The cell cycle period in these cell lines was much shorter and aneuploidy disorders were common (6). ER negative tumors were resistant to endocrine therapy and chemotherapy protocols (7). Estrogen dependent cell lines such as MCF-7, BT474, T47-D, 600MPE and ZR-75-I have isolated from invasive or primary ductal or adenocarcinoma tumoral samples (3). Differentiation capability, chemotherapy and endocrine therapy responsiveness and disease prognosis in animal models in ER positive cell lines was better than ER negative cell lines. ER/PR-positive breast cancer tumors were 60% likely to respond to endocrine therapy. Tamoxifen, Fareston, Arimidex, Aromasin, Femara, Zoladex/Lupron, Megace and Halotestin were some of endocrine therapy drugs (8). MCF-7 (Michigan cancer foundation-7) has isolated from luminal tissue of patient who has suffered adenocarcinoma which was ER/PR positive and Her2 negative. MDA-MB468 has isolated from basal tissue of patient who had high metastatic adenocarcinoma which was ER/PR and Her2 negative (9). Apoptosis induction was one of the major cell death mechanisms that have promoted the suicide of cells, resulting in an advantage, unlike necrosis in cellular immune response. Apoptosis signals activation capability was different for types of cells (10). Apoptosis was not the main pathway for the death of cancer cells in response to common treatment regimens (11), but pro apoptotic elements and anti-apoptotic factors had very important role in tumorigenesis (12). Malignant cells were heterogene and apoptosis activation pathway has suppressed in many types of tumoral cells therefore capability of cells to activation of this pathway was very important in tumor prognosis (13). In contrast to apoptosis and autophagy, necrosis has considered as an uncontrolled form of cell death. Morphologically, necrosis has characterized by vacuolization of the cytoplasm, loss of membrane integrity and cellular swelling (14). The resulting release of intracellular components into the microenvironment could provoke an inflammatory response. Tumor cell necrosis could provoke an inflammatory response, and stimulate an immune response towards potentially malignant cells (15). This chemotactic and inflammatory response’s function just like tissue damage and bacterial infection that has led to neurotic inflammation that cause to release hypoxia, angiogenesis, cell proliferation and cell movement (invasiveness) signaling factors (16). Additionally multiple lines of evidence has indicated that immune inflammatory cells in necrosis path way could led to tumor promoting by production of EGF, VEGV, proteases and many types of factors that caused to angiogenesis and metastasis (17). DNA damage caused by UV (Ultra Violet) radiation has induced pro apoptotic and cell cycle arrest checkpoints expression (18). Low dose of UV-B has caused to DNA damage and apoptosis (19), high dose of UV lead to necrosis (20). Cell death was strikingly polymorphic; it could proceed via necrosis (as in complement-mediated cell death) or apoptosis. Capability of apoptosis cascade activation was important in immune response recruitment (21, 22). In this paper we have evaluated serial dose of UV-B exposure on ER positive and ER negative breast cancer cell lines and its effect on apoptosis or necrosis induction in these cells. Cell culture and irradiation: Human Breast cancer cell lines, MCF-7 (C10082) and MDA-MB468 (C10095) have purchased from Iranian biological research center (IBRC) and have cultured 2D for 24 hours in Dulbecco’s modified Eagle medium: Ham’s F12 (DMEM: F12) (Gibco # 31331 - 028) with 10% heat inactivated Fetal Bovine Serum (Gibco # 26140111) and 1% penicillin streptomycin (Gibco # 10378032) in 37°C incubator with 5% CO2 cell culture incubator. UV exposure has carried out using UV laboratory Lamp at 290 nm and dose of 154 J/m2 to 18 KJ/m2. Afterwards UV exposure, cells have incubated for 24 or 48 hours in 37°C incubator with 5% CO2 and 95% of humidity. Cell lines have detached by treating with 25% trypsin and 5% EDTA and then have washed with phosphate buffer saline (PBS) (Sigma # P4417 - 50TAB). Apoptosis analysis have carried out in FL2 and FL3 channels with Cyflow flow cytometry (Partec, Germany) after FITC labeled Annexin V and PI (Ebioscience # 88 - 8005 - 72) staining, 20 minutes in dark condition (Figure 1). MCF-7 cells and MDA-MB468 harvested after 24 or 48 hours of UV exposure and analyzed by flow cytometry after staining with PI and Annexin V (Figure 2). The percent of double positive population in both of cell lines after 24 hours incubation was more than 48 hours and the percent of double positive population for MCF-7 cell line after 24 hours was significantly higher than 48 hours in comparison with MDA-MB468 cell line (Figure 3). PI positive cells in two cell lines after 48 hours incubation were more than 24 hours incubation. 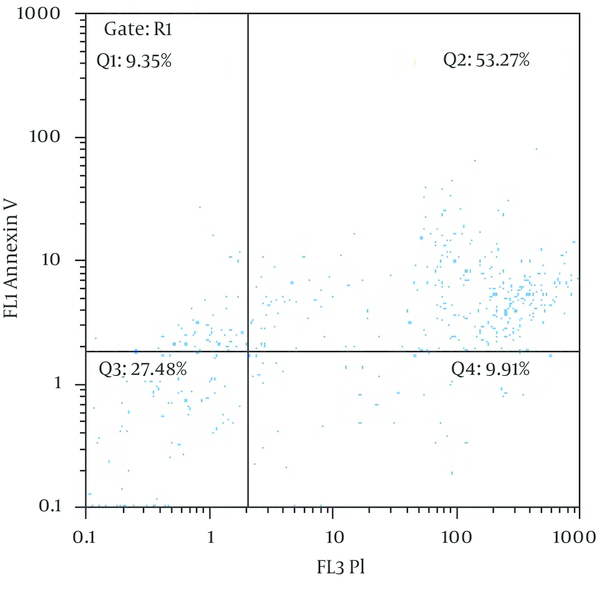 Frequency of PI positive MDA-MB468 cells were significantly greater than MCF-7 PI positive cells in both of incubation times (Figure 4). 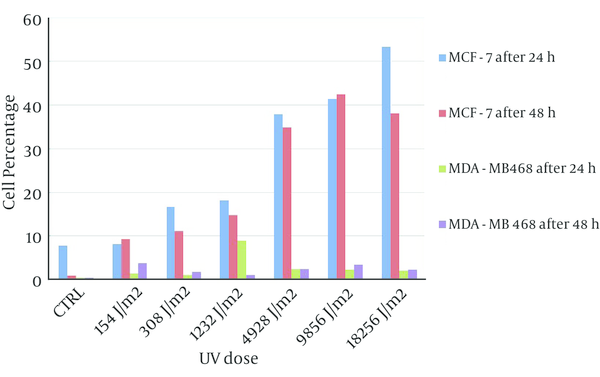 Apoptosis rate in MCF-7 cells have increased following UV exposure in a dose dependent manner and in MDA-MB468 cells, the percentage of apoptotic cells have not significantly affected by different dose of UV (Figure 5, the value for control experiments were subtracted from all tests). Frequency of PI positive MDA-MB468 cells has significantly increased in accordance with UV exposure dose. 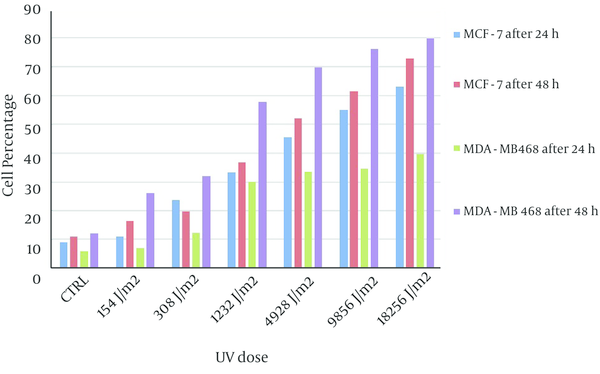 MCF-7 PI positive cells also increased by increasing of UV dose exposure however frequency of PI positive MDA-MB468 cells was significantly more than PI positive MCF-7 cells (Figure 6, the value for control experiments have subtracted from all tests). 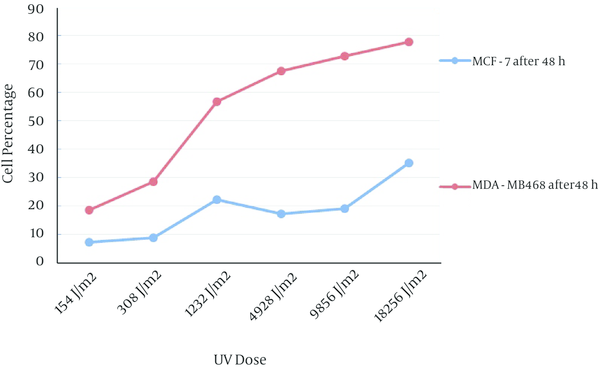 Frequency of the MDA-MB468 necrotic cells in response to UV exposure after 24 hours were more than apoptotic MDA-MB468 cells, and UV dose scaling up has not shown any effect on apoptosis rate of these cells. 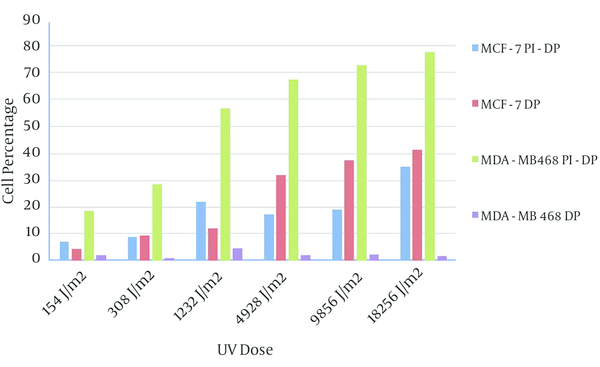 The frequency of apoptotic MCF-7 cells after UV exposure in both incubation times were more or equal to PI positive MCF-7 cells (Figure 7). The rate of apoptosis in MCF-7 cells in both incubations times, especially in 24 hours, was greater than MDA-MB468 cells in the same setting. However PI positive cells percentage in MDA-MB468 cells was significantly higher than other MCF-7. This might indicate that necrosis pathway in MDA-MB48 cells and apoptosis pathway in MCF-7 cells were dominant. Ultraviolet radiation-induced apoptosis has mediated by activation of CD95 (23) and Fas pathway activation by UV is a feasible model for induction of apoptosis in malignant cells. On the other hand cytotoxic T lymphocytes and natural killer (NK) cells have killed target cells such as tumor cells by two main mechanisms, namely, the perforin/granzymes and the Fas ligand (Fas-L) apoptosis pathways (24). UV irradiation-induced apoptosis of mammalian cells has associated with two key signaling cascades due to activation of cell surface receptors such as the Fas and TNF receptors (25, 26). This has included the Fas-FADD-caspase-8-axis and the Jun N-terminal kinase (JNK) cascade. Both of these signaling events have required for the initiation of the apoptotic machinery (27). There was a good correlation between ER expression and FasL pathway in human ER positive cells such as monocytes (28), FasL expression has enhanced by estradiol “in situ” production from ER positive cells. Although FasL has expressed in both of ER positive and ER negative cells (29) however, apoptosis induction by TRAIL pathway in ER negative cells was more effective (30). ER expression and autocrine estrogen production or treatment by estradiol increase apoptosis rate in many types of ER positive cancers (31). In a similar study on human lymphocytes, necrosis and apoptosis induction have assayed by flow cytometry after UV exposure and results have shown high dose of UV exposure cause necrosis and apoptosis signaling activation started after first hours of UV exposure (20). Our data has shown that cell cycle period of ER negative cells was shorter than ER positive cells and its sensitivity to UV exposure was different in comparison with ER positive cell line, This might be in accordance with tumor cell behavior in vivo, considering the fact that the ER negative cancers were often more aggressive and nonresponsive to chemotherapy (7) and these were more metastatic than ER positive cells. If the necrosis pathway was predominant in these cells and apoptosis signals was low or lower than ER positive cells this could explain the differences in immune pathogenesis of breast cancer in ER positive and ER negative cells. Microenvironment of necrotic cells could be different from apoptotic cells. This difference could affect “T helper” responses, and natural immune system recruitment has shown different manner. The type of microenvironment might play an important role in fate of cancer and anti cancer cell immune response interaction as has shown in colorectal cancer that necrosis was predominant in poor differentiated colorectal carcinoma and tumors with high necrotic cells frequency has shown very poor prognosis (32). In conclusion UV exposure was a simple model for apoptosis and necrosis pathway study. 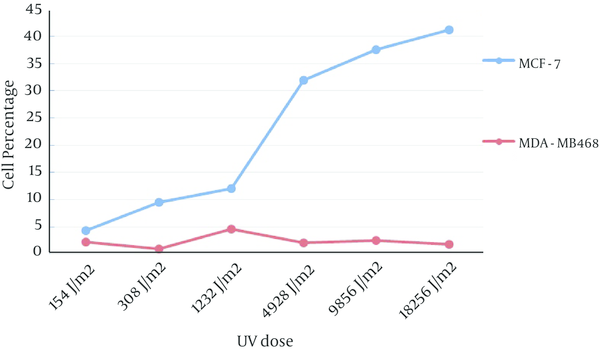 We have compared two cell line responses to same dose of UV exposure in ER positive and negative cell lines in this study. Apoptosis pathway activation in ER positive cells was dominant in comparison with ER negative cell line. The difference could be due to early activation of apoptosis pathway in ER positive cells, in comparison with ER negative cells which needs further investigation.